My father, Daniel Laverty, was born in Southampton on 5th August, 1918. His parents were from Old Southampton from a shipping background. Dad also was in the Royal Navy and fought in the Battle of the Atlantic 1939-40. He was born almost in the water just off Shamrock Quay River Itchen. The Asturias is documented in his Merchant Seaman's Book. Dad stayed in Australia with Amy Longden for several years in a relationship and they had a son Michael O'Laverty who still lives in Perth, Western Australia, with his family of four and grandchildren. I have been in touch with them and would love to meet up with him one day - he is the image of my father! Dad was a sensitive man and very caring and loved his garden, always grew vegetables and loved the outdoors but was a bit of a roamer due to his sailing years I guess. 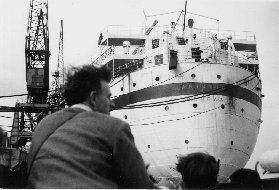 Daniel Joseph Laverty was a crew member of the Asturias on the journey of May 1948 when he met a passenger, Amy Longden who was travelling with her mother, Eva. Aged 29, Daniel had already been married and left behind an ex-wife and daughter, Margaret, in the UK. He settled with Amy in Perth where he gained Australian Citizenship in 1949. Daniel and Amy had a son, Michael in 1950. However he eventually returned to the UK in 1954 where he settled down and had two more children, Dawn (1957) and Paul (who died at birth in 1963 in Bournemouth, Hampshire). Daniel passed away in 1971 and is now buried at Millbrook Church, Southampton. Amy stayed in Australia, marrying a Mr McCumstie and having six children. She passed away in 1978. I have sent some pictures of Dad when he was in the Navy just before he sailed to Australia in 1947. There was very little left in Southampton after the war hit badly by the blitz. 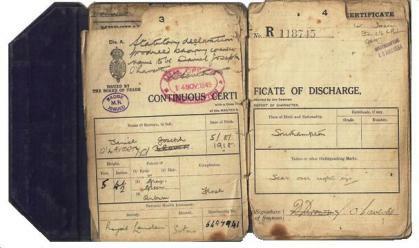 My Father returned to Southampton in 1954 to see his other child Margaret O'Laverty from his first Marriage. My Dad was 53 when he died and had a hard life. He was 21 when he went to war and travelled a lot across the world - Australasia and the Americas and Norway as a Merchant Seaman. His Father was Irish and was a Shipbuilder from Liverpool/Belfast. These men were made from different Stuff weren't they?